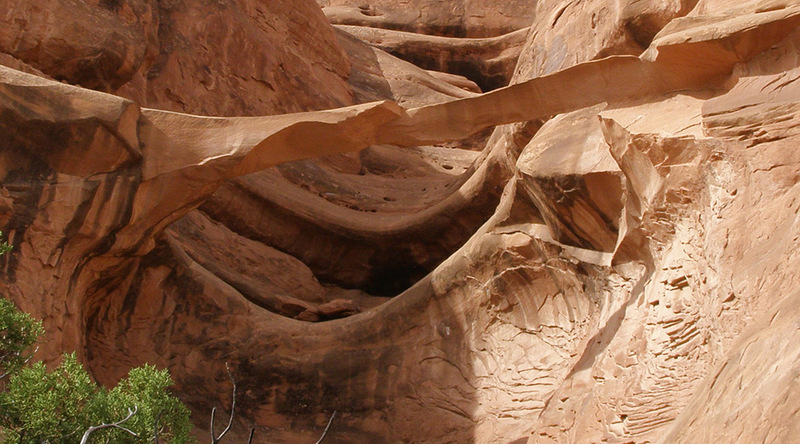 These photos show a dramatic change in the appearance of Ring Arch in Courthouse Wash in Arches National Park. Sometime between April 29 and October 7, 2014, a significant portion of the arch collapsed, leaving the arch very much thinner and looking quite delicate. Ring Arch Spring 2014. From left to right: Sandra Scott, Susan McDowell, Gus Scott, and John Slivka. Photo by Larry Beck taken during NABS Spring Arch Rally. Ring Arch Fall 2014. Photo by Susan McDowell taken during NABS Fall Arch Rally. As the photos show, the left abutment remains intact, but shortly beyond, a large amount of rock including a portion of the right abutment has fallen. The arc of rock that remains shows no fractures in the photos, but it showed no fractures in the earlier photos either. Standing under the arch, it appears as though much of the lower right front of the span has fallen. Ring Arch may be seen almost directly west from the park road from a long pullout on the west side of the road (NABSQNO 12S-621729-4278463) about 0.15 miles southwest of the center of the Courthouse Wash Bridge. Binoculars will help, as the arch is about 1.3 miles from the road and the arch location is not obvious. There is no established trail to Ring Arch. Walking directly to it from the park road view is not recommended since it is difficult to avoid disturbing sensitive desert soils. It’s also unpleasant to deal with the stickers in dense patches of Russian thistle and several tumbleweed-filled drainages. 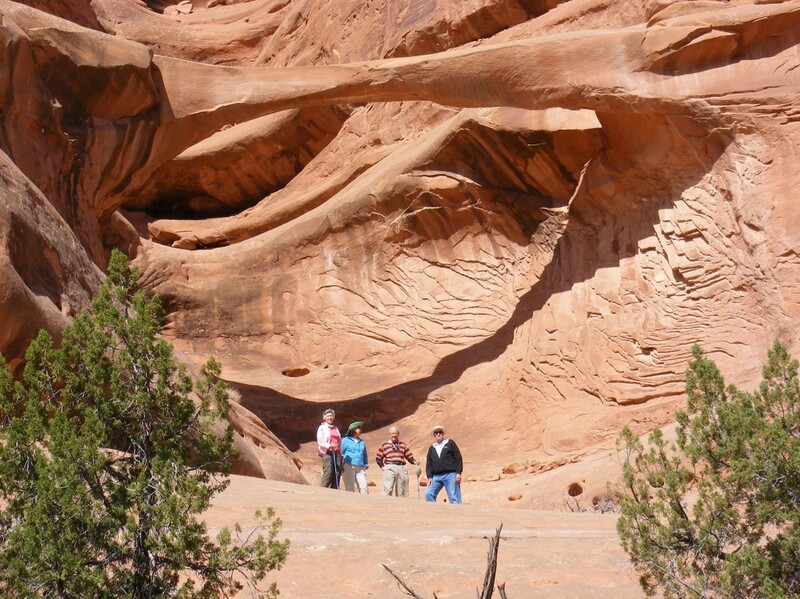 A better route starts on a use trail at the parking area on the northwest side of Courthouse Wash (12-622006- 4278791). Ring Arch is tucked in a northeastward facing alcove and has morning sun. Courthouse Wash can have standing water, serious mud, and voracious seasonal biting insects. Walks taken after a dry spell and when insect populations are low are recommended. If you are good at finding use trails and return the way you came, your round-trip walk will be about 4.0 miles. This is a wonderfully pristine area, so stay in drainages when possible and do your best to insure there is only one narrow footpath leading to the arch. 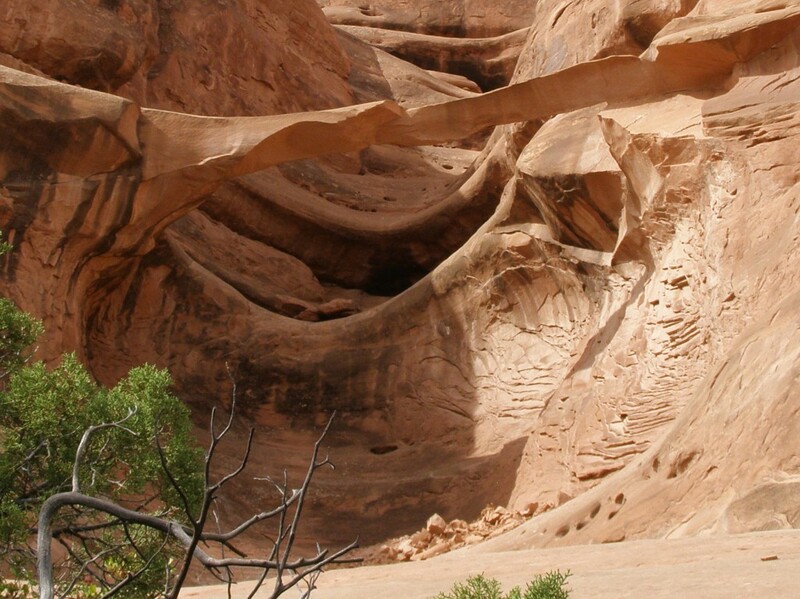 Ring Arch is a very old pothole type natural arch, which has formed in the Slick Rock Member of Entrada Sandstone. The Slick Rock Member was deposited in tidal mudflats, beaches, and sand dunes during the Middle Jurassic period between 180 and 140 million years ago. Sources agree that Harry Reed, a Moab photographer and custodian of what was then Arches National Monument, first reported Ring Arch in 1940. Slim Mabery, a former district ranger at the monument, named the arch in 1961. The name comes from the shape of the arch. According to the World Arch Database, Ring Arch’s span is 45’ with a height of 39’. After the recent rockfall, the arch may be marginally taller.